WebsiteBuilder.com offer a classic drag-and-drop interface with great customization options that allow you to design a site that suits your business’s needs. With 1000s of templates and 100s of images available, WebsiteBuilder.com offers you great flexibility when it comes to designing your site. A lot of the templates boast a professional feel so they don’t require much customizing, which is great if you want to get your site up and running quickly. However, if you do want to personalize your website, you can do this by changing each “section” to suit your needs. Adding a blog can be done at the touch of a button and you’re provided with some pre-formatted templates. These are much more limited compared to the site templates, but if you just want to add a generic blog to your site this won’t matter that much. Your website will be mobile-ready if you upgrade to the Premium Plan or above; definitely something that’s worth considering if you’re going to be driving a lot of traffic to your site. If you want to see stats you will need to upgrade to the Premium Plan or above in order to do this. There you’ll be given access to a lot of useful features, including Google and Bing tools, Adsense, and keyword density. However, even with the free account, you do have access to the “advanced settings” which allow you to set site meta tags, the site header HTML, and the site footer HTML. Another cool feature is that you can choose a site Favicon (the logo that’s displayed in the tab on a web browser). Social links can be added in the management section with many of the popular social sites already listed. And Google Maps is something that’s automatically been incorporated into many of the templates. This is great if you’re wanting a fuss-free website builder that requires very little modifying. For e-commerce sites, you’ll need to opt for the most expensive e-commerce package, which has been specially adapted to suit online stores. This includes third-party Ecwid shopping carts or the option to add PayPal buttons (including Buy Now or Donate). All of the plans, including the Free Starter Plan, come with free hosting but you will need to buy your own domain if you’re going to use the free package. Free domains and a mailbox are included with all of the other upgraded packages, which is what makes them so worthwhile. You’ll also get free ad credits when you upgrade to any of the paid plans. For any additional emails, you will need to pay $5 a month. When you’re looking at the plans it’s not very clear what storage amounts you’re given. 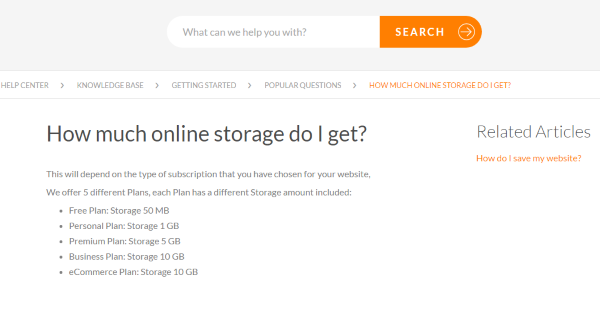 However, a little bit of research in the support section reveals that you get 50MB with the free plan, which goes up to 10GB on the business and e-commerce plans. 50GB isn’t a lot, though, so if you are looking at the free plan be aware that you won’t have much room for images, videos, and other graphics. The website builder is free for all, which is great, especially considering its innovative drag-and-drop design. However, a lot of the additional features that many users will want and need are only accessible through upgraded plans. The personal plan is the next package up from the free plan, but this is more expensive than the Premium and Business plans, so it makes more sense to try those two. The Premium plan starts at $5.99 a month and is a great option if you need a site that’s going to function well, is mobile-optimized and incorporates good SEO tools. 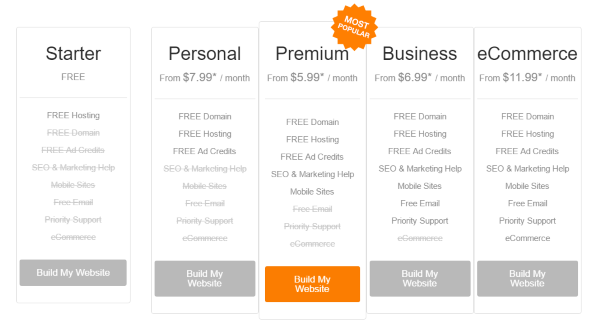 The Business plan starts at $6.99 a month and enhances your user experience with free email and priority support - something you’ll definitely benefit from if you’re running an online business. And finally, the e-commerce plan starts at $11.99 a month, giving you access to the carts and PayPal buttons mentioned previously. Be aware that the enticing plans detailed above aren’t in place forever, they’re just for your first term of service. These then jump up considerably, almost doubling in price if you pay monthly. However, to keep things less expensive, you may want to consider 24-month contracts. Priority support is offered to those on the Business or E-commerce plans. Those who aren’t paying for these will have to make do with email support (which is available 24/7), live chat or the support forums. Within the support forums you will find a great knowledge base that’s been divided up into relevant sections. These include adding content, social media, and mobile. When you upgrade and you’re given access to the SEO features, you’re also provided with a free SEO book, which is a great thing to have if you’re new to the website building trade. If you do have a billing enquiry, WebsiteBuilder.com recommend you call them (phone lines are available in the US/Canada, UK, and Australia). A fantastic website builder for those who aren’t looking to spend too much time designing or creating new formats. With professional templates that have a number of useful features already integrated, this is a great option for those who want to spend little time and money getting their website up and running. And if you’re interested in an online store, the e-commerce feature will allow you to start selling products in no time at all.